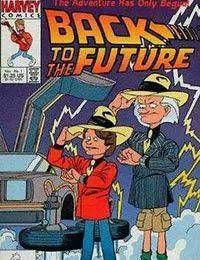 The Back To The Future comics are based upon the characters seen in the cult hit movie series, Back To The Future. Both the films and the comic book series sees young Marty McFly and Dr Emmett Brown traveling through time sharing bizarre and exciting adventures along the way.<br />Dr Emmett Brown is the one responsible for the creation of the time machine, he spent many years planning out and developing the Flux Capacitor, which is what makes time travel possible.<br />However, in order for Marty or the Doc to time travel, they need to reach a speed of 88 miles per hour crossed with a nuclear reaction. So Dr Emmett Brown used a modified DeLorean as his time vehicle, which is the main piece of equipment used in their stories.<br />Many of the stories revolve around the time vehicle, and it creates much of the drama. For example, the first time Marty McFly traveled back to 1955, he had no plutonium to bring him back home again. Or again, in the old west when the fuel tank was pierced, and he therefore couldnt move the vehicle up to a speed of 88 miles per hour.<br />The comics are a little less techincal than the films are, but are still based on the same premise.